Iran is continuing to claim that Israel and Saudi Arabia are strengthening their ties, Israel Hayom reported on Monday. The latest report, in the semi-official Fars news agency, claimed that a Saudi Arabian delegation flew to Israel about 10 days ago for meetings with high-ranking Israeli officials, including Prime Minister Binyamin Netanyahu. The Iranian report also cited an “Israeli radio” report, which said that Saudi Deputy Defense Minister Salman bin Sultan visited Israel and toured an army base along with members of the IDF General Staff. Israel did not respond to the report. This report about supposed meetings between Israelis and Saudis is the latest in a series of Iranian reports, all in the Fars news agency, about the supposed relationship between Israel and Saudi Arabia. Two weeks ago, the news agency claimed that the head of the Saudi intelligence service met with several senior Israeli security officials, including the head of the Israeli Mossad, in Geneva on November 27. An earlier Fars report said that Israel and Saudi Arabia had teamed up to launch a virus against Iran’s nuclear program. Prince Turki Al-Faisal, former head of the Saudi secret services, told NRG/Maariv last week he does “not believe” the validity of the Iranian reports. At the same time, Maariv reported last week that Prince Turki met MK Meir Sheetrit (Hatnua) and Itamar Rabinovich, formerly Israel’s ambassador to the U.S., at a conference in Moncao. 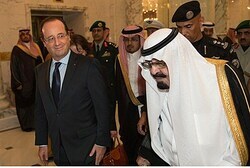 The Saudi prince reportedly publicly shook hands with Rabinovich and held a discussion with MK Sheetrit. Israel Hayom said the Iranian reports may be trying to smear Saudi Arabia in popular Arab opinion, or to prove some sort of Sunni-Israeli conspiracy against Tehran. A recent report in the British Sunday Times claimed that Israel and Saudi Arabia may team up to fight Iran if talks between Iran and the West fail to curb Iran’s nuclear program.